Bring back your own unique beach candle as souvenirs. IT’S almost lunch time when we land at Jeju International Airport after an hour’s flight from Gimhae International Airport in Busan, Korea. Our local guide Sunnie, assigned by Jeju Tourism Organisation, immediately takes us for lunch at Badapungkyung, a Muslim-friendly eatery located not far from the airport. Yes, Muslims travelling to Jeju can rest assured that there are quite a number of Muslim-friendly restaurants all over the island. In fact, there is a list of Muslim-friendly restaurants in the country available on www.english.visitkorea.or.kr. As Jeju Island is famous for its seafood, it’s a seafood lunch for us. We have the sea urchin soup that may sound exotic but it’s staple food in Korea. It tastes fresh with a generous amount of seaweed. The bits of sea urchin flesh make the soup a little sweet. The grilled mackerel is so delicious; I never knew mackerel could taste that good! But then again, one type of fish is not enough, we are also treated to a deep-fried snapper that’s absolutely tasty. As the eatery is located by the sea, our lunch is made sweeter by the breathtaking view. The restaurant faces the Yellow Sea, near the east side of the island. Dark clouds and strong winds whip up waves along the coastline. Occasionally, airplanes fly by. Now, I can see why this small island, measuring 1,848sq km or about twice the size of Singapore, is one of the popular destinations, even for the Korean newlyweds. So much so, it has been nicknamed Honeymoon Island. In fact, the domestic flight between Seoul and Jeju is said to the most popular air route in the world. Jeju Island is also known as Samdado which means the island of three abundances — rocks, wind and women. Stones such as basalt can be found almost anywhere on Jeju Island. A type of volcanic rock, basalt is among the many other consequences of volcanic activity in the past. 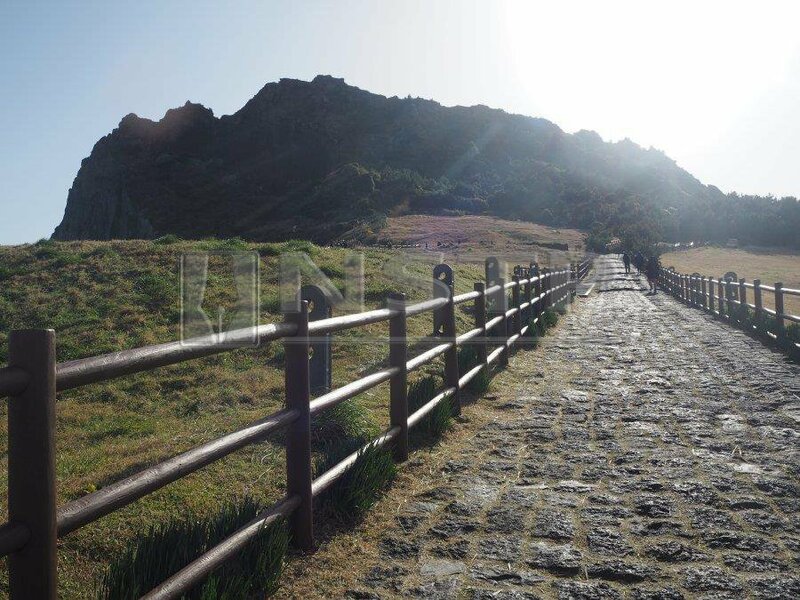 In ancient times, it is said that Jeju people used basalt stone to build the wall and fences of their homes. Even today, it is used for building landmarks. 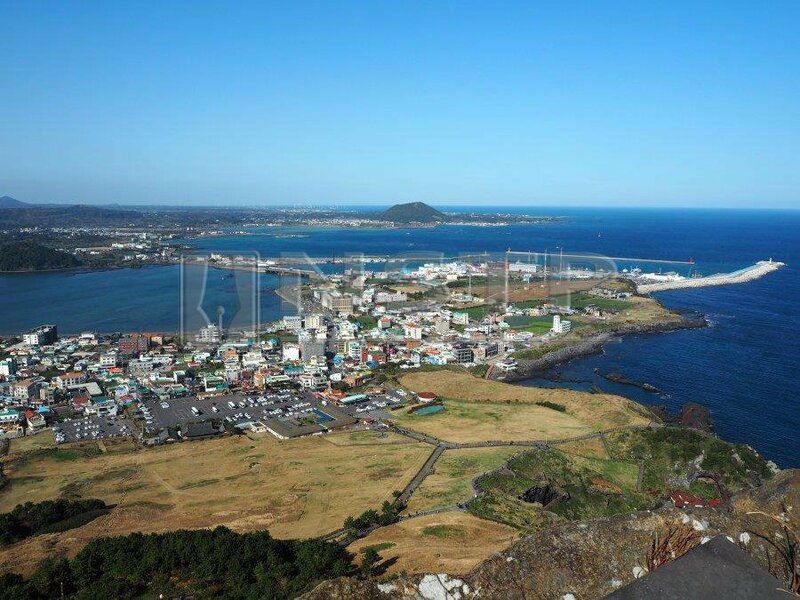 The geographical location of Jeju Island attracts a lot of wind. The constant wind has clearly affected the lives of the people here; the wind generates electricity for the houses on Jeju. It is said that along time ago many of the islanders were fishermen. However many were lost at sea and as a result, the women eventually outnumbered the men. This situation prompted many of the women to go out to work and become the bread winners. Yesterday ended with a shabu-shabu dinner at Cheonhaecheon Restaurant. The restaurant provides halal meat. Oh, this place also has a prayer room for Muslims. While it served as a good finale for our first day in Jeju, the sumptuous dinner actually followed after an exciting and thrilling time at SumokwonThemePark in the northern part of the island. We had some fun in the virtual world at Playbox VR in the theme park. 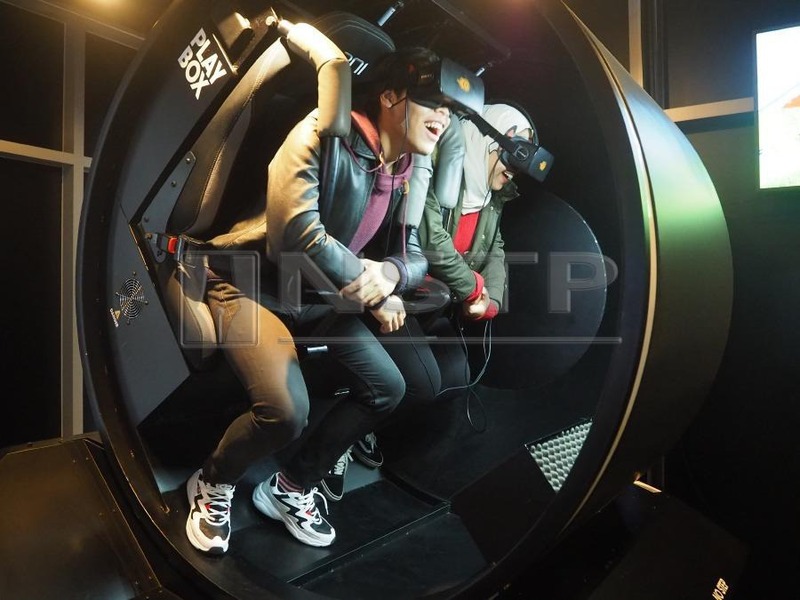 The park offers various virtual reality gaming experiences including virtual roller-coaster rides. There’s also an ice museum which houses ice sculptures and a giant ice hill for you to sled down. Tried it, and loved it! Ahh, the feeling of being a kid once again. Today, our itinerary takes us to the outdoors to feel the fresh, clean air of Jeju. What better way to enjoy the air in Jeju than by hiking at Seongsan Ilchulbong Peak, a Unesco World Heritage Site, which was formed by an underwater eruption of the seabed some 5,000 years ago. From our hotel in Yeon-dong, Jeju-si, Sunnie takes on a one and a half hour drive to the Snow in Jeju foot of the peak at the eastern end of Jeju Island. Along the way, you can view beaches. You can also make a quick stop at Gwangchigi Beach not far from Seongsan Ilchulbong. Smell the fresh sea air and view the peak from this beach. Also known as a Sunrise Peak, Seongsan Ilchulbong was designated a Natural Monument in 2000. It was recognised for its outstanding landscape and geological value by Unesco and in October 2010, it was named a Global Geopark site. Since it only takes about 20 minutes to reach the top, the hike up the peak makes for a good morning activity. Do take care as the stairs are steeper near the top. But for someone with low stamina (likeme), it’s best to have breaks along the hike to rest and catch your breath. Never mind if kids and aunties overtake you. However, the slow climb gives me opportunities to enjoy the natural rock formations and foliage along the peak. Although tiring, it is worthwhile once I see the magnificent view from the summit and the vast lake surrounding it. The ascending and descending paths are two different routes so you will have different views when going up and down the 180m trail. 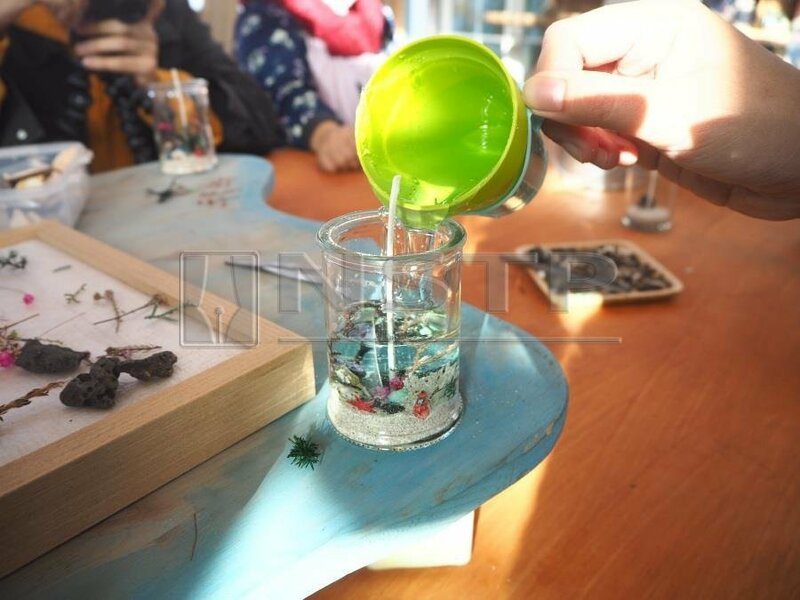 In the afternoon drop by Jeju Pureonbada Candle and make your own souvenir candle. Using real items from the beaches, you can design your own seabed and choose your own scent for the candle wax to make the beach candle. 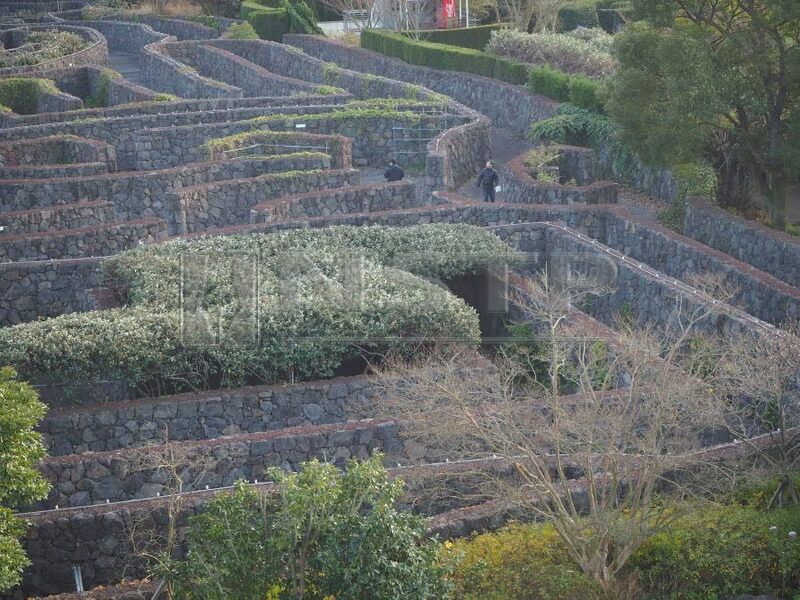 Fans of Korean variety show Running Man will recognise this place, the Maze Land. For another fun activity with your partner, Maze Land has three types of mazes for you to explore, namely the Whinstone Maze, Wind Maze and Woman Maze. Make sure you don’t lost and separated from your loved ones while at Maze Land. These routes were created to reflect the three main things you can find on Jeju Island - rocks, wind and women. After a tiring day, we tend to our growling stomachs with halal Indian food at Bagdad Restaurant. This place is very popular with both locals and Muslims from abroad. To wash down the food, we drink chai tea, a pleasant spiced tea with milk and sugar. A perfect way to end the day. Not a place to be missed in Jeju, Camellia Hill is the largest arboretum in East Asia housing 500 Camellia species. Anywhere in the garden is basically an Instagrammable spot. Just strolling with your loved ones along the beautiful forest trails can make you forget time. Luckily for us, we get to experience the first snow in Jeju for the year. Pretty flowers and white snow... what more can you ask for, right? A wish come true for me, a stranger to snow! Moving on, tangerines are also in season. So we head to Jeju E-in Tangerine Farm to pick fruit. For a small fee, you can pick the tangerines and eat them on the spot, there’s no limit. However, you are only allowed to take away 1kg of tangerines. Tip from farm owner: pick the smaller ones as they tend to be sweeter. There’s also a cafe where you can relax and try their homemade tangerine tea and jam. The jam is so yummy. 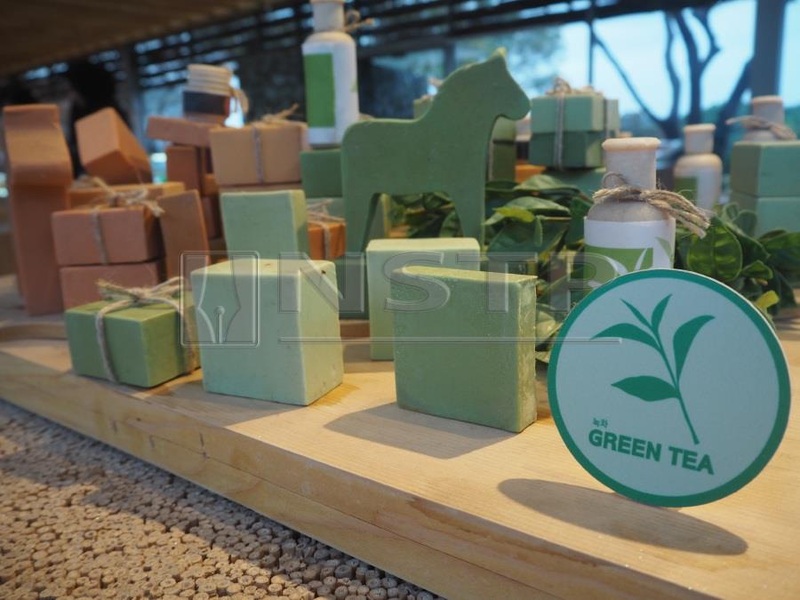 Make soap together with your significant other at Innisfree Jeju House using ingredients from Jeju itself. You can choose from three kits—volcanic clay, tangerine and green tea. It’s a fun experience for couples to show off their skills. I also buy some Innisfree skincare as it is cheaper here. For K-pop fans, head over to Play KPOP, where you can dance and sing your heart out at the Live Holo Concert of your favourite idols. We go for the G-Dragon holographic concert and boy oh boy, I am amazed at how much it looks like an actual live concert. This interactive digital theme park also has a dedicated K-pop exhibition which features the history of Korean music and dance. Don’t forget to try out the interactive photo booths that allow you to take almost realistic pictures with your idols. 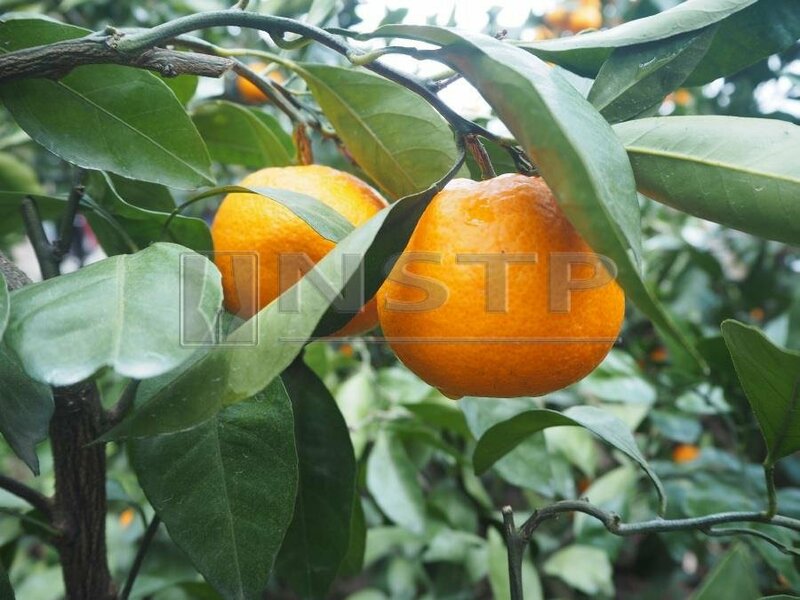 Eat tangerines and pick some to bring back home. Just across Play KPOP, there’s a Yellow Cafe which has everything banana on the menu including a Banana Latte. Get the oh-so-creamy-and-delicious banana icecream and banana milk! Do not leave Jeju without tasting its famous cutlass fish dish. At Chunsimine restaurant, they serve it grilled or stewed, and both are tasty. Packed with spices, the stew reminds one of the taste of asam pedas. No wonder Koreans love our asam pedas! I can finally tick off Jeju Island from my bucketlist. A place of wonders, Jeju brings only the best memories for me. While the language barrier can be a problem, learning a few Korean phrases is a great help. “Kamsahamnida Jeju” for also letting me experience my first snowfall. Food-wise, Jeju Island has restaurants that cater for Muslims, with signs displayed in front of their outlet. Who doesn’t like making their own soap, right? Especially when it’s made of natural ingredients. Seafood restaurants are abundant all over the island. Oh! You must be wondering about shopping. Dongmun Traditional Market sells clothing, kitchenware dried products and other foods. I didn’t do much shopping because it was winter and jackets, gloves and thick socks, which I can’t wear back home, were on sale. As it opens until midnight, you can take your time and do your shopping leisurely. Buy your souvenirs here as well as they are less pricey compared to the regular marts and grocery stores. Now, grab your partner’s hand and plan a trip to Jeju Island.